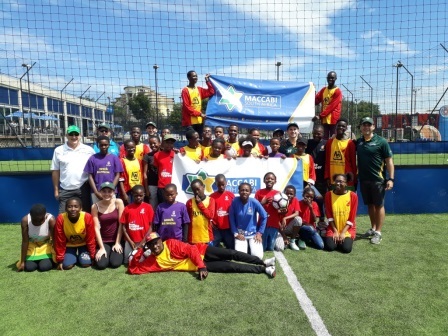 On Sunday 25 March, 40 young leaders and participants from two of Afrika Tikkun's Johannesburg centers took part in and thoroughly enjoyed a sports day that was put together by the Maccabi SA Youth Committee. The event took place at Discovery Soccer Park at the Wanderers Club in Johannesburg in the morning. With perfect weather accompanying the event, the day got underway. 32 underprivileged children from Hillbrow and Alexandra township were soon smiling laughing and running around on the immaculate Astro-turf fields. The activities for the children included, double touch rugby, 5-a-side football, bean back throw, skipping and an incredibly fun and challenging few rounds of capture the flag. Each sport was run by one of the young leaders from Afrika Tikkun’s various development programs. These leaders made sure all the games played were clearly explained, that the rules were followed and that everyone was having fun. Maccabi volunteers assisted where necessary and got firmly stuck into the fun and games. Thomas Taole who heads up the sports divisions at all 5 of Afrika Tikkun’s centres said that the activities that the kids were doing had an educational and development aspect to them in that it taught team work, communication understanding, friendship and more important life skills. After the games were finished everyone enjoyed a burger and drink in the shade and the children still beaming from their experience chatted and socialised. Through a donor, Maccabi was able to donate 7 soccer balls, 4 rugby balls, 10 hula-hoops, 20 bean bags, 10 whistles and ball pumps and well as a volleyball set with 2 balls. Sports equipment is a crucial ingredient into the success of Afrika Tikkun’s sports programs and the donation will go a long way to ensuring that this aspect of their development is strengthened and enhanced as much as possible. This will be Maccabi’s fourth major donation of sporting equipment to Afrika Tikkun. 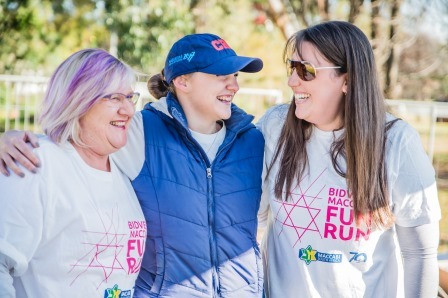 Maccabi SA and Afrika Tikkun’s relationship continues to go from strength to strength and events like these are a testimony to how the Jewish community is committed to helping the greater community of South Africa. Maccabi is lucky enough to be able to do this through the wonderful medium of sport and especially being able to help a deserving and wholesome organisation such as Afrika Tikkun. Maccabi SA would like to thank Discovery Soccer Park and the Maccabi SA Volunteers for their assistance in making the event possible.